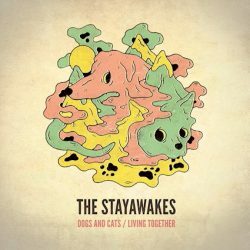 Southsea punk rock band The Stayawakes release their debut album Dogs And Cats / Living Together on 11th June via Surefire Discs, BadHORROR and ShoveItUpYourCult Records. Named as an homage to the 1980’s slasher movie genre, south coast UK power-pop quintet The Stayawakes deliver big-hearted jams and sweet harmonies. Underpinned by friendships going back decades, schoolyard rivals Andrew Ricks (vocals/guitar) and Peter Foulk (guitar) formed a lifelong bond over a piano and a Dire Straits cover. In 2001 they teamed up with Steven Hart (drums) to form melodic post-punk outfit Day of the Fight. With big ambitions and a really crap van, they toured extensively through the noughties until the wheels literally and metaphorically came off the bus. After a hiatus Andrew, Peter and Steven had a need to get in a room together and make noise again. Pulling from influences such as The Lemonheads, Beezewax, Posies, Ash, Dinosaur Jr, The Smiths, Honey Rider, Sugar and Teenage Fanclub to name a few, you’ll find Dogs And Cats / Living Together to be a thoroughly enjoyable and pleasant album. It doesn’t set the world alight but if it’s uplifting and instantaneous power pop you’re looking for then it doesn’t get much better.